Buzz Kill Ramblings of Tim Louie: IS THE LOTTERY CURSED? With the Powerball jackpot at $1.3 billion, many of you, like me, are thinking, "What would I possibly do with $1.3 billion dollars?" I mean after taxes, it might be around $600 million, but I'm sure many of you can live with that, right? But the question remains, what would you do with that kind of money? You have a better chance of getting struck by lightning than winning Powerball, but according to the stats, if you did win, there is an even better chance that you'll go broke or die. Nearly 70% of lottery winners end up broke within seven years. Even worse, several winners have died tragically or witnessed those close to them suffer. It's almost like God is saying, "Sure, you can have millions of dollars, but I want something in return." So, still want to win the lottery? 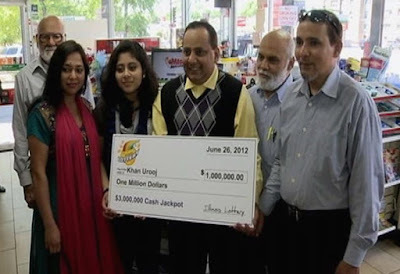 The New York Daily News posted this article about Edward Ugel, author of the book Money for Nothing: One Man's Journey Through the Dark Side of Lottery Millions. The article was pretty eye-opening as he Ugel explains in his book the thousands of lottery winners he's known, few were happy and only a small number lived happily ever after. He said, "You'll be blown away to see how many winners wish they'd never won." I don't know about that. I think if you're smart with the money, it can go a long way. Then again, how the hell would I know? The most I ever won was $10 on a scratch off. One of the unlucky winners Ugel wrote about was Abraham Shakespeare. Just weeks before Shakespeare was killed, he told his mother he wished he never won. Shakespeare hit for a big $30 million jackpot back in 2006, causing his friends and family to hound him for money. He befriended a woman named Dorice "Dee Dee" Moore, who tricked him into believing she was trying to protect him from greedy people around him. She then convinced him to transfer his assets to her before he went missing in 2009. In 2012, she was sentenced to mandatory life without parole for his murder by a judge who called her "cold, calculating and cruel." I mean if you look at this story, why would Shakespeare befriend some total stranger and actually listen to her about "his" money. I wouldn't have. What a "tragedy"! Get it? See what I did there? Shakespeare? A tragedy? Anyway, another story followed David Edwards, a former drug addict felon, who won a $27 million jackpot in 2001, while unemployed in South Florida. He quickly blew through the money by purchasing a $1.6 million house in Palm Beach Gardens, three race horses, a fiber optics company, a Lear Jet, a limo business, a $200,000 Lamborghini Diablo and a multitude of ther luxuries. Edwards and his wife also turned back to drugs and had numerous run-ins with police for possession for crack cocaine, pills and heroin. See? Here is someone who sounds like he made some of the right investments in lucrative businesses, but all of the other accessories were unnecessary. And in this case, it sounded like his drug-fueled past came back to get the better of him. He lost all of his money in just a few years and ended up living in a storage unit surrounded by human feces. He later died in hospice at the age of 58. And the last story from the article that I wanted to share with you is based on the photo I posted above. That was 46-year-old Urooj Khan from Chicago. He dropped dead the day after winning $1 million in 2012. An autopsy revealed that Khan died of cyanide poisoning. Both his sister-in-law and father were suspected to be involved in his death but no one was ever charged. His winnings and properties were split up between his daughter and widow.